The high performance, impact resistant Oase Lunaqua 10 halogen spotlights are ideal for illuminating large ponds and water features. 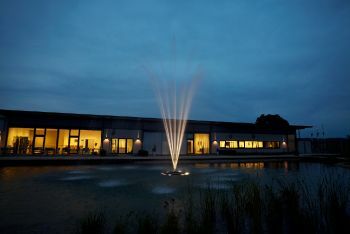 These spotlights are as well suited to commercial fountain projects as they are to garden ponds and water features. The Lunaqua 10 can be submerged underwater up to 4 metres deep or installed on dry land and will accept 35 watt, 50 watt or 75 watt halogen lamps. 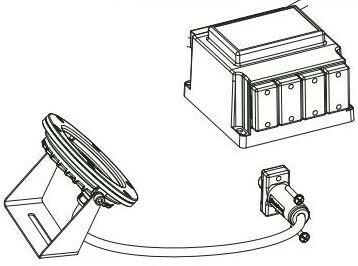 If using 75 watt lamps, the spotlights must be submerged in water due to cooling requirements. 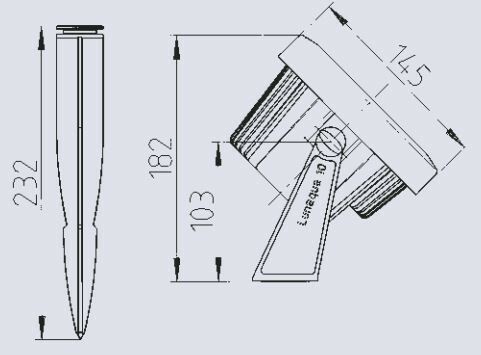 The Lunaqua 10 are supplied with spikes for mounting in soft ground or can be used on hard ground or pond floor using the Lunaqua Mounting Base (not supplied). 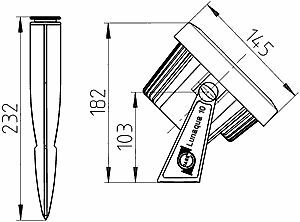 Alternatively the flexible bracket supplied with the spotlight can be secured to a flat surface allowing the spotlight angle to be adjusted. 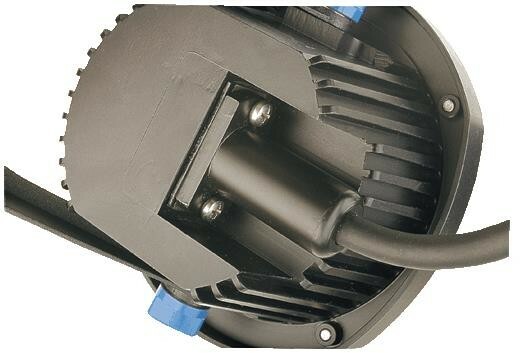 This spotlight requires connection to the Lunaqua 10 fully submersible transformer and connecting cables (not supplied) and up to 4 spotlights can be connected to a single underwater transformer. 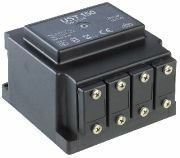 The total power of a single transformer system must not exceed 150 watts, so this will allow 4 x 35 watt, 3 x 50 watt or 2 x 75 watt lamps to be used. You can mix different lamps on the system provided you do not exceed 150 watts. 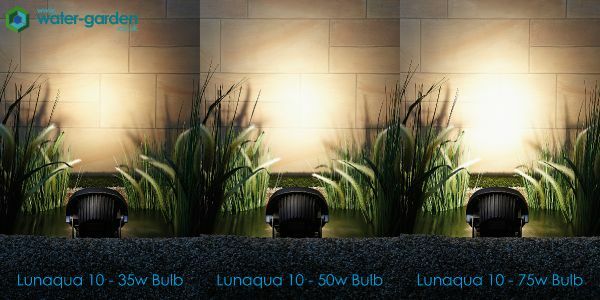 The Lunaqua 10 is a flexible halogen lighting system ideal for intense warm illumination of large fountains, water features, lakes and large ponds both private and commercially. The Oase Lunaqua 10 spotlights require separate halogen lamps and can be fitted with either 35 watt halogen lamps, 50 watt halogen lamps or 75 watt halogen lamps depending on the light intensity required. The spolights are suitable for installing both in the water and on dry land if using 35 watt or 50 watt halogen lamps. 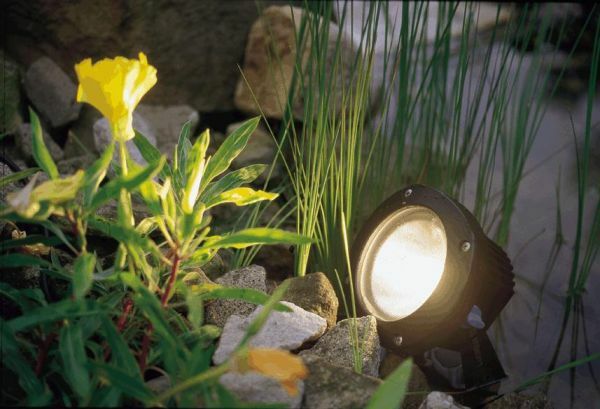 If using 75 watt halogen lamps these lights must be submerged underwater to prevent over-heating. 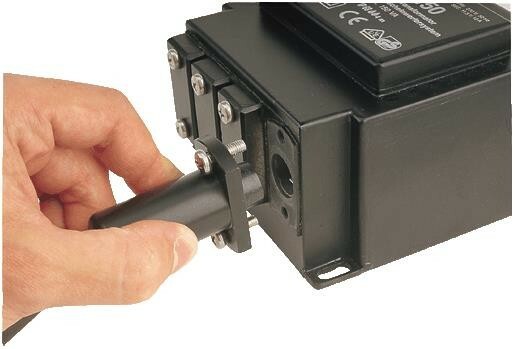 The Lunaqua 10 spotlights connect via separate connecting cables to the separate Lunaqua 10 Submersible Transformer which can support up to 150 watts of Lunaqua 10 spotlight and connect to up to 4 spotlights directly. 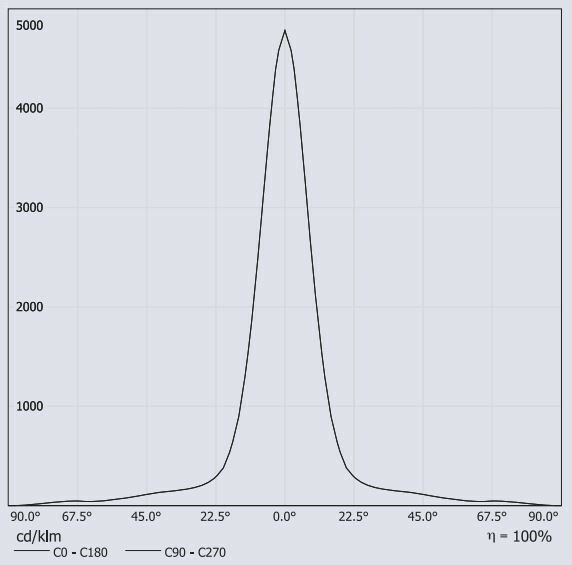 Due to the maximum power limitations of the transformer, the number of spotlights that can be connected and operated from a single transformer is limited by the watts of the chosen lamps. These lamps can be mixed (i.e. 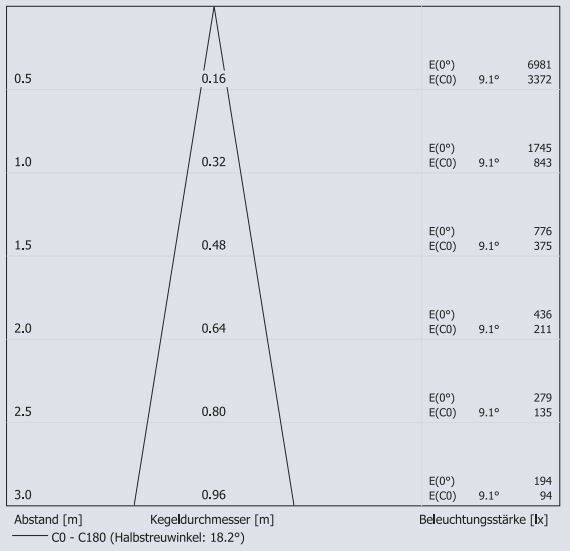 1 x 75w and 2 x 35w) as long as the total wattage does not exceed 150w. If all lamps are the same in terms of watts, the transformer can support 4 spotlights at 35 watts each, 3 spotlights at 50 watts each and 2 spotlights at 75 watts each. To operate more than 4 spotlights or wattage totaling over 150w would require the use of a second transformer. The special connecting cables are available in 3 lengths, 2.5 metre connecting cable, 5 metre connecting cable and 7.5 metre connecting cable and these can be selected to reach your chosen spotlight locations from the underwater transformer accordingly. 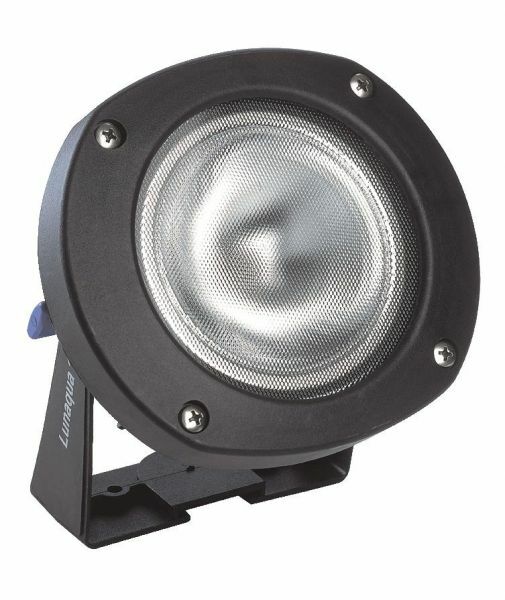 The Lunaqua 10 halogen spotlights are supplied with sturdy reinforced plastic mounting brackets for securing to a suitable hard surface. The spotlight directional angle can then be adjusted to focus on the intended lighting area. 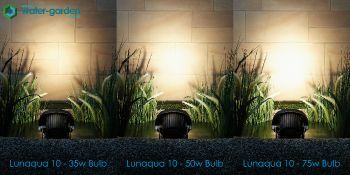 The Lunaqua 10 spotlights are also supplied with ground mounting spikes for staking into softer ground. This high quality, flexible lighting system is perfect for larger garden ponds, lakes, large water features and high fountain jets. These Oase lighting products also suit commercial fountain applications well due to their robust build, high-performance and installation versatility. If more information, product specification or email quotation on this system is required please call or email Water Garden Ltd.